What do you think? I absolutely, positively (couldn't help myself) LOVE it! I love it, especially since blue is my favorite color. They did a good job on this cover. My favorite of the three! It's beautiful Heather! Have a safe trip home. I love it! I think this is the best cover out of the three books. 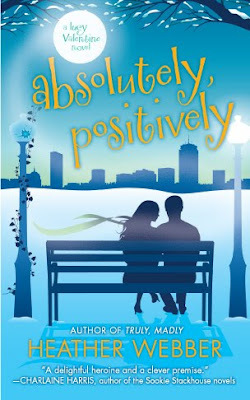 Very beautiful, warm & cozy cover for Absolutely, Positively. I Absolutely Can't Wait! Are there going to be more than the 3 books, or do you know yet? Have a wonderful time on your book tour & have a safe journey back home. Love this! It is by far my favorite so far. Yay! I LOVE it!!!! I can't wait to get my hands on it!! I LOVE Lucy!!! It's my favorite also, love it! It's wonderful! How come I have to wait until August to get my cover for my Feb. 2011 release. Should I picket my editor's office? Lorraine, definitely start picketing. And take pictures because I want to see it! I'm not sure why it's so early--might have something to do with ARCs, though I could be making that up. I'm waiting to hear on the future of Lucy Valentine, so cross your fingers--and tell everyone you know to go buy a book. LOL! Publishing houses love good sales. Oh, okay, authors love them too. That cover is absolutely, positively beautiful!